Sodexo, one of Ireland’s leading on-site services providers, has appointed Julie Ennis as managing director of Corporate Services, Ireland and Northern Ireland. Julie joins the company from Bank of Ireland, where she was the Head of its Mobile Sales Force for three years. Margot Slattery, who held a dual role as head of corporate services and country president, is moving into the latter position on a full-time basis, reflecting the growth of Sodexo’s operations in Ireland. Representing Ireland on Sodexo’s UK and Ireland regional leadership committee, she oversees all its divisions here, which includes corporate, education, healthcare and government services, linking in with the Irish executive team. Margot also sits on the Board of Sodexo Ireland and will continue to steer its growth across both the public and private sector here. In her new role, Julie will be responsible for the management and strategic growth of Sodexo’s corporate services offering in Ireland and Northern Ireland, reporting into David Bailey, CEO of Corporate Services for the UK and Ireland. Within the corporate sector in Ireland, Sodexo works with clients in finance, pharma, technology and FMCG, including Ervia, Gas Networks Ireland, Bord Bia, Central Bank, PayPal, Dell and Microsoft. Julie Ennis has held numerous senior roles in sales, product development, strategy and operations at the Bank of Ireland Group since 1998. She was a Group Sponsor of Bank of Ireland’s Be At Your Best’ employee wellbeing programme and a committee member of its LGBT and Gender Balance networks. 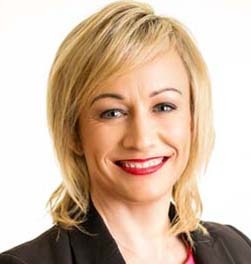 She is an MBA graduate of the UCD Michael Smurfit Graduate Business School and a National Council member of the Executive Institute. Sodexo is a leading provider of food and facilities management services to clients in business and industry, education, financial services and healthcare in Ireland and Northern Ireland. It employs approximately 3,700 people in 230 locations across Ireland with a combined turnover of €141 million in 2018.